The Vikings were dominated by the Eagles in the NFC Championship game, ending their season with a 38-7 loss. Updated: January 21, 2018, 9:30 p.m.
Sports can leave fans with exhilarating moments and games where you aren’t sure what happened. The latter scenario was running through the minds of Vikings fans across the state on Sunday night. A defense which had been so dominant all season was destroyed by Eagles backup quarterback Nick Foles. Philadelphia scored 38 unanswered points, running past the Vikings 38-7 to claim a trip to the Super Bowl in Minneapolis. Minnesota was outscored 62-19 over the past six quarters and lost their fifth NFC Championship game in 40 years. Last week, the Vikings were on the end of miracle. A magical season continued on the heels of one of the single biggest moments in Minnesota sports history. Just one week later, the rug was pulled out from underneath Vikings fans. Eagles quarterback Nick Foles carved up the season’s top defense for 352 yards and three touchdowns. A methodical 9-play, 75-yard opening scoring drive by the Vikings seemed like an afterthought. Moments later, quarterback Case Keenum’s arm was hit as he threw a pick-six to Patrick Robinson, who returned it 50 yards for a touchdown. The play was like a lightning rod struck from above. The Vikings’ defense was frozen in their tracks. Missed tackles, explosive plays and 38 unanswered points followed. The Vikings’ pass rush was non-existent and multiple coverage breakdowns allowed Nick Foles to pick the defense apart. It was like the Vikings’ defense was replaced with a completely different group of players. They allowed 456 total yards, including 352 yards to Nick Foles through the air. Minnesota was surrendering a second-best 5.6 yards per attempt against opposing quarterbacks, along with a 58.7 percent completion percentage. Entering the game, Foles was completing just 56.4 percent of his passes and averaging 5.3 yards per attempt. 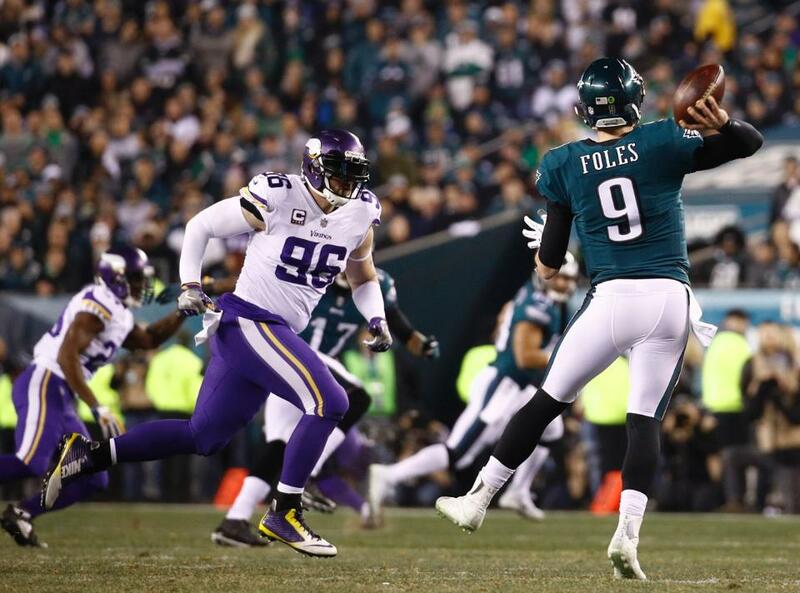 Sunday night, Foles completed 78.7 percent of his passes for 352 yards and three touchdowns. Minnesota couldn’t muster any pressure and was dominated up front on both sides of the ball. Foles connected on two deep passing touchdowns of 40-plus yards, torching Harrison Smith and Trae Waynes on separate occasions. Philadelphia’s tempo and rhythm on offense had the Vikings on their heels all night. Four of the Eagles' scoring drives spanned more than 75 yards. Minnesota was down 14-7 before halftime, but a strip sack by Derek Barnett put an end to the flash of momentum. A long pass from Foles to wide receiver Alshon Jeffery and a late field goal had the Vikings in a 24-7 hole at halftime. Philadelphia’s front-seven pressured Case Keenum all night and the Vikings’ defense couldn’t stop any of the run-pass option looks the Eagles were throwing their way. Rashod Hill struggled all night at right tackle, forcing the Vikings to use more slide protection. Philadelphia schemed the Vikings well and executed in every phase of the game. Their defense created three turnovers, two of which changed the entire landscape of the game. Offensively, the Eagles converted a startling 10 of their 14 third down tries against the Vikings’ historically stout situational defense. The Vikings were simply dominated in every way on defense and the mistakes piled up. Minnesota had played just 30 percent of their total snaps while trailing this year and it showed. Adversity struck and the Vikings weren’t able to respond like they did all year. A season with 14 wins ended in a puzzling way as the team’s well-known strength was ripped to shreds on a big stage. Philadelphia dominated the Vikings in every phase, including from a scheme standpoint. The Vikings reached the NFC Championship and hosting the Super Bowl seemed like a real possibility. A dominating defense and balanced offense had carried the team all season. Sunday night, the execution simply wasn’t there and the top defense in football had no answer for a well-coached Eagles team. It will take quite some time for everyone involved to figure out what happened to one of the most complete Vikings teams in recent memory.